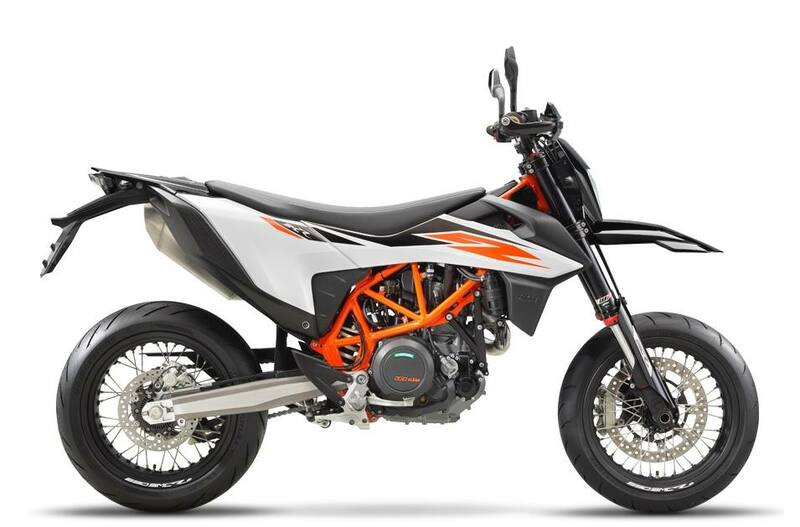 Street Slayer: The KTM 690 SMC R raises the bar for street hooligans. The revised chassis and styling are boosted by the latest 690 LC4 motor and an updated electronics package, so whether you express your tarmac-sliding talent on mountain roads or on the track, you'll be drifting into the future with a maxed-out grin and your veins coursing with adrenaline. Handling is enhanced by the latest fully-adjustable WP APEX suspension, so all you have to worry about is focusing on the road ahead and twisting the throttle to the stoppers. The latest 690 LC4 engine is all about smooth, powerful performance with the right mix of character to propel you in and out of corners at warp speed. Every aspect of the LC4 engine design is geared towards providing a more heart pounding riding experience. The Super Single: The LC4 690 cc single-cylinder engine combines powerful acceleration from the very lowest revs with an outstanding free-revving nature and refined engine running. Another big plus is besides the engine being extremely economical with fuel it also has long service intervals of 10,000 km, keeping running costs low. A resonator chamber balances out pulses in the intake tract and makes the throttle response smoother with reduced vibrations. A lightweight, compact cylinder head contains four valves and a single camshaft placed over the intake valves, and a secondary balancer shaft driven by the timing chain. The intake valves are actuated by finger followers and the exhaust valves by a rocker arm. Twin balancer shafts, one in front of the crankshaft and the other in the cylinder head reduce vibration, which ensures a smoother ride. Easy Access Filter: Accessing the airfilter for maintenance is easy thanks to the airbox being located under the seat. This makes servicing the bike simple, and strees free, at the end of a long day's ride. Stainless Steel Exhaust: The exhaust system is made using high-quality stainless steel. It's routed as close as possible to the bike to help with the slim profile. 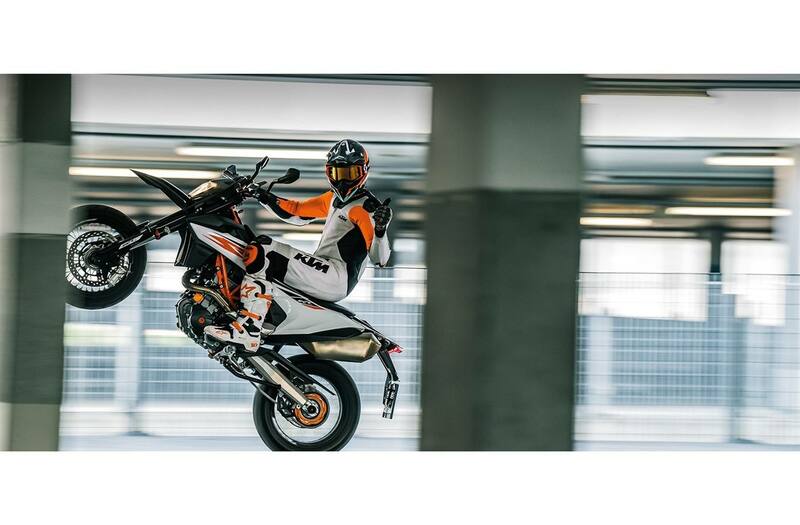 Developed on supermoto tracks and tested in a wide range of street riding scenarios, the all-new chassis handles superbly and behaves like a champion, no matter how far you push the limit. High-end equipment like WP APEX suspension the latest Brembo brakes will give you the control you need when pushing the limits. Strong Yet Light: The frame is manufactured from lightweight sections of top-quality chrome-molybdenum steel tubing of varying thicknesses. This type of balanced frame design provides high torsional rigidity for best handling and rideability, while a more specifically-tuned longitudinal flexibility can absorb the wheel impact energy, supporting the suspension for reduced rider fatigue. Tried and trusted - the effective use of the rear fuel tank as the main structural element of the subframe, keeps weight low and eliminates design complexity. Maximum Super Moto control is enhanced by the WP APEX 48 upside-down fork. The split fork design developed by WP and KTM has been adapted for the 690 SMC R. It is fitted with springs on both sides with separate damping functions - compression is on the left and rebound on the right-hand side. The cool thing is they have no negative influence on each other. So damping can easily be adjusted via the dials on top of both fork tubes, each with 30 clicks of adjustment. Complementing the front fork is the WP APEX shock absorber that is connected to the swingarm by a linkage. This ensures a progressive suspension character and a high resistance to bottoming out. Fully adjustable, including high and low-speed compression, you can set up the shock absorber to any circumstances and rider preference. Serious Stopping Power: Sublime class-leading BREMBO brakes combined with lightweight wave discs - 320 mm diameter front and 240 mm on the rear wheel - provide a crucial combination of stopping power and a consistent brake feel. Pure Control: The KTM wheels use lightweight, CNC machined hubs and high-end black 17" rims to combine maximum strength with minimum weight. They are fitted with Bridgestone S21 tyres for maximum performance on the street, and plenty of grip for racetrack usage. Ample Fuel, Optimum Feel: The completely redesigned larger fuel tank now has a capacity of 13.5 litres. It also acts as a load-bearing part of the chassis, making it stiffer for a more optimal feel. The 690 SMC R's ergonomics have been completely redesigned making the bike look sharper and slimmer. This, along with a reduced seat height, promotes better handling and improved comfort while also allowing extreme lean angles for those prepared to really crank it over in turns. Optimum Control: The lightweight tapered 808 mm wide handlebars are rubber mounted to reduce vibrations. Their width and shape are aimed at providing optimum control in all situations. Slim Yet Comfortable: The slim profile needed for maximum lean angle is helped by short footrests, while a removable rubber insert ensures comfort with street boots. Easy Access, Optimal Control: The 690 SMC R's seat height is 890mm for ease of access without sacrificing lean angle, while the seat material is finely grained for grip with leather suits. Gaining full control over your supermoto while maximizing its performance has never been easier with the updated electronics package that includes cornering ABS, and MTC (Motorcycle Traction Control) for optimal street-riding performance. Benefit from the full range of assistance modes with user-friendly adjustability. Quickshifter + allows effortless electronically assisted clutch-free gear shifts, whether changing up or down. There are two ride modes: ‘Street' mode gives a sporty throttle response where cornering-sensitive MTC limits wheel slip and keeps wheelies to a minimum for optimal street riding performance, while ‘Sport' mode provides more aggressive throttle response with reduced traction control (without cornering sensitivity) to allow drifts and full control of the slide, aimed at track or very sporty street usage. The modes can be easily switched over from the handlebar, making adjustment on the fly possible. Supermoto ABS allows rear wheel lockup and reduced ABS on the front wheel for the hooligans who like to have more control over the motorcycle when pushing the limit through turns. The MTC (Motorcycle Traction Control) lean-angle sensitive traction control system reacts immediately the instant the rear wheel rotation speed becomes disproportionate to the riding situation. In mere milliseconds MTC reduces engine output with an extremely smooth, barely perceptible intervention at the throttle valves, until slippage is reduced to optimum proportions for the selected ride mode and current angle of lean. For particularly ambitious riders, the traction control can also be switched off.